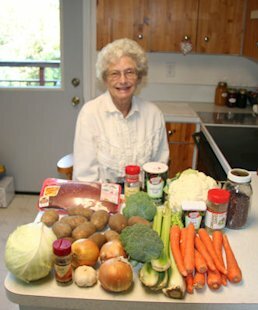 This recipe produced 11 Quarts of Beef Vegetable Soup. This is a delicious thick vegetable soup. The vegetables and the amounts of the vegetables used will somewhat depend on the vegetable's availability and their price. We want the pot full so after the first set of meat, spices and vegetables are simmered, we will turn off the heat and add the other vegetables to a non boiling pot. We will add water when needed and fill the pot with more carrots and/or potatoes to near the top. Those later vegetables will be cooked during the pressure canner's 90 minutes of processing.